Volt / hz: 115 volt / 60 hz. Larger and longer size to provide more contact time to UVC output. 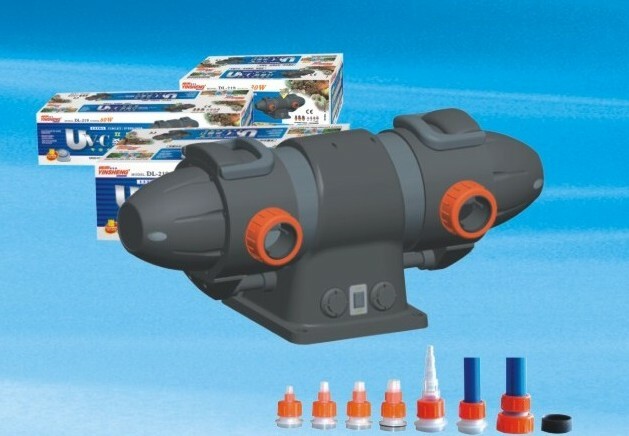 UV lamp working status can be checked easily with elliptical lens at both end covers, inlet and outlet's clear viewing prots of the UV sterilizer. Ballast is protected from water damage. There are two handles to carry UV sterilizer easily. High quality quartz sleeve allows maximum transmission of UV light. Flat bottom makes easy installation and can be fixed with screw tightly. The lamps emit UV light of particular wave length (approx. 254 mm) that can penetrate cells and damage genetic material (RNA & DNA) and proteins. The UV lamps emit UV light of a particular wavelength (approximately 254 nm) that can penetrate cells and damage genetic material (RNA and DNA) and proteins. pathogens come in all shapes and sizes, the ideal level of UV exposure (also known as the "Zap does" depends on the target organisms. The actual zap does is determined by the intensity or wattage of the lamp, the contact time or flow rate of the water, water clarity, and the size and biological characteristic of the target organisms. Zap dosage in microwatt seconds per square centimeter (mW sec/cm2) for Algae and fungi are approximately 22,000 and 40,000. When the quartz sleeve gets dirty with any sludge build up, it must be kept clean to maximize the efficiency of UV light. In case of controlling parasites, prolong the exposure time of water to the UV light. It can be accomplished by lowering flow rate of water. 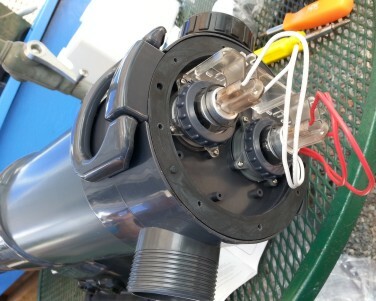 UV sterilizer would be connected to a suitable filter device to trap any suspended particles that can be attached on the quartz sleeve. Replace an UV bulb when lamp effectiveness declines with time. It is recommended to replace UV bulb (lamp) every 6 months. 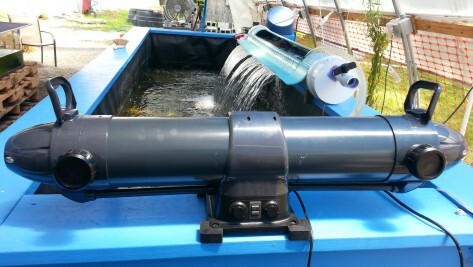 This UV sterilizer can be used for saltwater, freshwater aquarium and pond. Maximum aquarium size is calculated by UV dosage that kills free-floating algae and bacteria at 30,000 pw/cm2 and tank turn over of 3 to 4 times per hour. Maximum pond size is calculated by UV dosage that can algae blooms and / or kill all the algae but not all the parasites in the pond. UV clarifier brings ultraviolet radiation when it is working which is harmful to the human eyes and skin, avoid eye contact and skin contact with the UV light at all times. 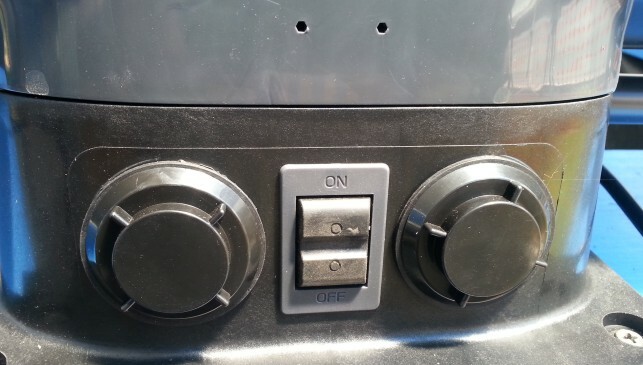 Please power off before opening up the unit. 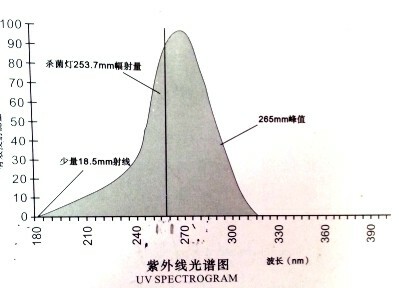 The working status of the UV lamp can be observed from a small elliptical white lens on the unit. The lens from the unit is normally brighter at the start of using the unit but after running for some times the light from the lens may become a little bit dimmer. This is due to the fact that some dirt has got into the unit and has blocked the lens. The efficiency of the product will not be affected by the dirt on the lens. When an "acute collision" or "a drop of the unit" happens, please check the unit. If there is any crack on the quartz tube and UV lamp, you must replace the broken parts before using the unit again. Make sure that your electrical voltage is compatible with voltage printed on the UV Sterilizer label. Always use a properly grounded electrical outlet. Do not install and operate UV sterilizer where it can be exposed to extreme weather conditions or temperature below freezing. Always unplug the UV sterilizer from the electrical outlet when not in use before replacing or cleaning parts.